This very popular program is tailored for the cruise ship passenger who wants to see the most St. Petersburg has to offer during a 3 day visit. Day 1: A full day of sightseeing includes visits to the Hermitage, the world's famous art treasury, and Peter & Paul Fortress, a place where the city got its start along with a local food market and lunch stop. You will see the history and how people currently live in this city. The Faberge Museum: This new museum housed in the historic newly restored Shavolov Palace houses the worlds largest and finest collection of Faberge Eggs and other works or art from the Fabrege workshops. 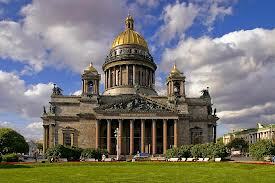 This is an exclusive viewing seen only on our tours and will be one of the highlights of the Baltic cruise. Nine of the famous Faberge Eastern Eggs have been consolidated into this one collection, after the remaining eggs where purchased by a wealthy Russian businessman for 0,000,000 who had the vision to create a private museum to allow the world to see what has been hidden away in private collections for years.. – Inside visit is included. Peter and Paul Fortress - Originally built to protect the city from Swedish attack, the fortress soon became Russia's “Tower of London”, a place for political prisoners - including Peter the Great's own son. The Peter and Paul Cathedral - The city's tallest structure in the days of Peter the Great and even today only the television tower exceeds it in the height. The ornate interior boasts gilded iconostasis, 18th century paintings and icons - and the tombs of many Tsars and Tsarinas, including Peter the Great and Catherine the Great. - Inside visit. Canal Cruise - St. Petersburg is also called “the Venice of the North”, and that is why our tour also includes a cruise on the River Neva and along the picturesque downtown canals. A 60-minute journey by small open-air boats travels the Fontanka River, the Kryukov Canal, the Moika River and the Neva River. Peter the Great conceived the Neva as the main thoroughfare of the city, and from the beginning the river was considered a vital part of the whole architectural ensemble. During the journey you pass under numerous picturesque bridges, and admire the exteriors of the many old beautiful buildings in St Petersburg. Also to view the low silhouette of the city from the wide Neva offers many unique photo opportunities. Your guide will provide a map so you can follow your route as you motor along. – 1-hour cruise with Box-lunch included. Day 2: A comprehensive full day tour gives you a unique chance to admire the most splendid palace and park ensembles of the 18th century, former summer residences of the Russian tsars that are considered to be exquisite monuments of Russian art with a worldwide reputation, The Palaces of Catherine & Peterhof Park. Metro (the city’s underground subway system) - Visit the magnificent "palaces of the People" as the St. Petersburg Metro used to be called during the Soviet Union years. The construction was started after the II World War, and its expansion continues endlessly, new stations opening periodically A ride is arranged between the Technological Institute and the Moscow Arch of Triumph stations. Since the entire St. Petersburg was built on the marsh land, the tunnels had to be dug deep, deep until solid soil was found, and you shall descend endlessly deep on extremely fast moving escalators. All the stations are totally different and individually designed. Some are luxurious with art work, statues, sculptures, mosaic walls, and chandeliers, some are simpler looking. – A ride and viewing of some picturesque stations is included. Church of the Savior on the Spilled Blood - This recently restored church sports a fantastic ornate "Russian-style" exterior with the traditional colorful onion domes. The church was built on the exact site of the March 1, 1881 assassination of Tsar Alexander II, while riding in his carriage along the canal embankment. That is also the reason why the church is called “spilled blood”. The church is distinguished by its picturesque silhouette and rich colorful decoration. The facade is lined with ceramic tiles and colored glazed bricks. Inside you shall view large size works of colorful mosaic of different religious themes. During the Soviet Union the church served as a warehouse and a storage space, and it took more than a decade to restore it to its current condition. This is unquestionably one of the most popular photo spots in St. Petersburg. – Inside visit. Lunches - One of the lunches will be in the elegant Summer Palace Restaurant on the day you visit Peterhof and the Fountain Parks. The other day features a new addition, a relaxing scenic cruise-lunch aboard your canal and river boat as it continues the tour along the historic and picturesque canals that during imperial times served as the main mode of transportation. In order to make your touring experience in St. Petersburg richer, we have combined the lunch and the Canal Cruise, which allows one more visit to be included in your limited time visit. Lunch on the third day will be held at the "Arcobaleno" restaurant. During the three days of touring in St. Petersburg your motor coach will pass through the city's residential and suburban districts en route to Peterhof on the Gulf of Finland. Among other things you shall pass the St. Nicholas Cathedral, and the nearby Theater Square with the world famous Mariinski Theatre (of such world famous ballet dancers like Vaslav Nijinski, Rudolf Nurejev, Mikhail Barishnikov) the St. Petersburg Conservatoire, and the monuments to the distinguished composers Rimsky-Korsakov and Glinka. You will pass by the Yusupov Palace (once the wealthiest person in Russia), and the symbol of St. Petersburg - the Bronze Horseman in the Decembrists' Square. Across the Neva River are the oldest buildings of St. Petersburg, including the Menshikov Palace (the mansion of the first governor of St. Petersburg), the St. Petersburg University, which are lined up one after another, and they never fail to impress a visitor every time you drive around this "museum in the open air." On the opposite side of the Neva there stands the Admiralty with its sharp and high golden spire, which is a compositional center of the entire city, and will never allow you to get lost.